I stared back at my reflection in the bathroom mirror. My hair was loose, my eyes dark-circled. I looked pale and a little gaunt. Alex was standing behind me, bare-chested and in jeans,his hands resting lightly on my shoulders. The bruise on his cheek had faded and there was only the faintest trace of a scar running at an angle across his cheekbone up to his eye. He looked tired too. The strain of the last week was starting to show. Alex and Lila are on the run, desperately trying to stay one step ahead of the Unit, which somehow is managing to track their every move. Whilst Alex is determined to keep Lila safe and her ability secret at any cost, Lila’s only thought is of finding a way back to California so that she can rescue her brother and mother from the military base where they’re being held. But the plan requires Lila to return alone to California, make friends with the enemy, and to risk losing everything - Alex, her family, and even her life. This book is probably one of my most anticipated reads of the year. I completely fell in love with Alex while reading Hunting Lila and I was desperate to make his acquaintance again. I was not disappointed. The first scene in the book is rather hot and sensuous and Lila is only getting a hair cut! The author has created a gorgeous couple who are definitely up high in my list of favourites. The action was fast and furious in Hunting Lila; in Losing Lila, we discover that the author has managed to kick it up even more. I was amazed at how fast paced everything was. It was like watching a movie, where I constantly needed to hold my breath. It reminded me of the American series, Heroes, as more characters appeared to develop unusual abilities as the story progressed. Most of the characters from the first book appear in this one, a lot of them coming into their own and becoming well loved characters themselves. Jack is a lot more appealing in this book, especially after certain personal discoveries, I wouldn't mind him being in my company at all. Although my heart still goes out to Alex. He is just awesome. 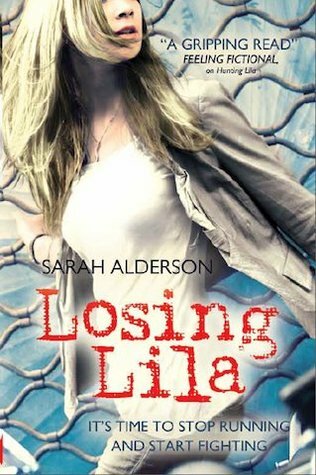 Sarah Alderson has added an extra Alex fix at the end of the book, that shows you how he felt when he realised he was falling for Lila. It will make your heart melt on the spot. Lila has really grown up in this book and learns to stand on her own feet which is slightly detrimental to her relationship with Alex. She learns to do some amazing tricks with her ability which helps to build her confidence. I have developed a little soft spot for Suki and Nate, who totally stole the book this time for me; their sarcasm and Alex lust just had me in stitches. The book comes to a climatic ending which left me feeling satisfied that the story had come to an end. However I am pretty sure, like many Lila fans, I won't be happy unless another instalment is written and I am presently nagging the author to write another via Twitter. The story brings a few rather unexpected twists to it, which really surprised me. These twists left me with questions! These questions need answering in a third installment! I love the way Sarah Alderson writes, her characters are so life like, you feel like you know them; her writing is so explosive, you are convinced you are watching the story unfold rather than reading it. I can't remember what life was like before her books. Sarah Alderson is fast becoming a force to be reckoned with in the YA market. She knows how to create white knuckle rides through fiction. Great review, Vivienne :-) Sounds like a series I should check out.